Wizards posted an interview with me regarding Draconomicon I: Chromatic Dragons, for which I was lead designer. More ink has been spilled on describing dragons than on nearly any other creature. These ancient, noble, yet savage beasts are a favorite subject of guidebooks, bards' tales, and ancient tomes and scrolls. Draconic knowledge is gained at risk of life and limb; dragons are rapacious, jealous of their secrets... and often hungry. Wizards of the Coast: With the release of Draconomicon, let's discuss dragons in general. Now that 4th Edition has been out now for several months, how do you feel 4E dragons compare to their counterparts of earlier editions? That is, in your experience how do you find 4E dragons playing around the table? From a design perspective, how are you approaching their creation any differently? 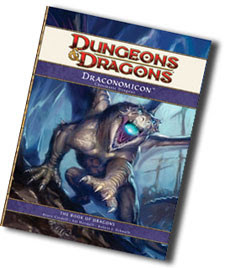 Bruce R. Cordell: Dragons were always the quintessential "solo" monsters, so in a sense, 4E dragons, unlike many other monsters, are more similar in theme to earlier edition dragons. A single dragon is a challenge the party fears to face. This was true before and should still be true now.